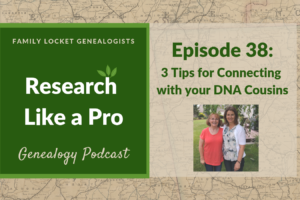 In our podcast episode today, Diana and I discuss how to use DNA evidence as you Research Like a Pro. We talk about each step of the research like a pro process and what it looks like when you are doing a DNA research project. 14 Day Mini Research Like a Pro Challenge – begins Jan 22! 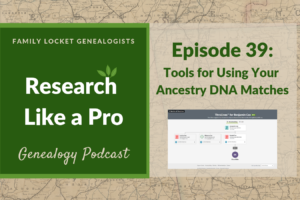 Beginners Guide to Genetic Genealogy: 19 short lessons by Kelly Wheaton give an introduction to the various types of DNA tests and how you can use them in your research. Each lesson includes links to videos, tools, and charts. 7 Organization tips for Your DNA Color Cluster Chart: Dana Leeds has created a simple, powerful system for viewing your DNA matches. More Automated DNA Match Clustering! : Kitty Cooper offers an in depth tutorial on how to use DNA clustering to organize your matches. DNA Spreadsheets: Spreadsheet templates for organizing your DNA matches. Organizing your Autosomal DNA Information with a Spreadsheet: Jim Bartlett’s detailed instructions for creating a spreadsheet for your autosomal DNA matches. Episode 246 – Fisher & Woodbury Talk How To Manage Your DNA Data & Accounts: Link to a podcast with Scott Fisher and DNA expert, Paul Woodbury talking about how he keeps track of DNA matches, kit numbers, passwords, and all the data. Includes a transcription of the podcast episode. DNA Sheets for Genealogy Planner includes a downloadable blank DNA planner sheet and ideas on how to fill it out. Hello! Just discovered your podcast and blog. I am so impressed! 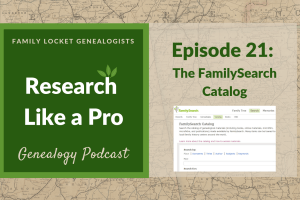 Genealogy is a passion of mine and while I am not an expert – definitely not a novice either…. but wow! am I learning a lot listening to your podcast! And love how your blog goes through all that you discussed in the podcast and all the amazing links you put in there are so helpful – THANK YOU! Kristin – thank you! You are so kind. We are so glad that our podcast is helping!